Toledo fell behind early and could never get back in the game in a 34-0 loss to Appalachian State Saturday night in the Dollar General Bowl in Mobile, Ala. The Rockets (11-3) trailed 20-0 at halftime, and App State outgained Toledo in total offense for the game, 458-146. Senior running back Terry Swanson rushed for 44 yards in the game. Senior quarterback Logan Woodside, playing in his final game as a Rocket, completed 16 of 29 passes for 124 yards. Senior Terry Swanson led the running attack with 44 yards. Sophomore Diontae Johnson caught two passes for 21 yards, finishing his season with a school-record 1,278 receiving yards. Appalachian State controlled the first half, taking a 20-0 halftime lead and outgaining the Rockets in total offense, 267-85, in the first 30 minutes. The Mountaineers got on the board on their third possession of the game on a seven-yard TD run by Jalin Moore with 4:06 to play in the first quarter. The 36-yard drive was set up by an ASU interception of Woodside near midfield that was returned 19 yards by Anthony Flory. ASU scored again on its next possession, a nine-play, 64-yard drive capped off by another seven-yard run by Moore. After the Mountaineers forced Toledo to punt, they drove 57 yards before settling for a 29-yard field goal by Chandler Staton to increase their lead to 17-0 with 8:09 left in the first half. Toledo’s second turnover of the game, a fumble by Johnson on the ensuing kickoff, set up the Mountaineers’ next score, a 23-yard field goal to up their lead to 20-0. ASU ended the half with Staton missing a 25-yard field goal on the final play of the half. 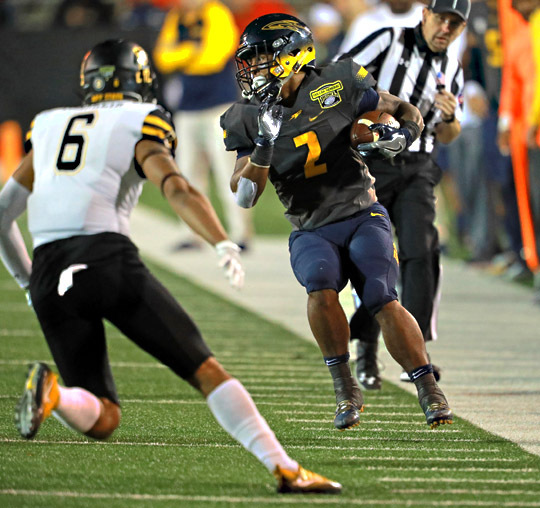 Toledo began the second half by driving into ASU territory, but the UT drive was stopped when Woodside was picked off by safety Desmond Franklin on the four-yard line. He returned it 35 yards to the ASU 39-yard line, setting the stage for a 31-yard TD run by Moore, his third score of the evening, to give App State a comfortable 27-0 lead. ASU scored on the first play of the fourth quarter, a three-yard run on a reverse by Malik Williams that made the score 34-0, which would hold as the final score. This entry was posted on Sunday, December 24th, 2017 at 12:03 am and is filed under Athletics, Events, News .